"You have to master and understand the new technologies to reach consumers. That is a new and immense challenge," says Luca De Meo, VW Group's marketing chief. 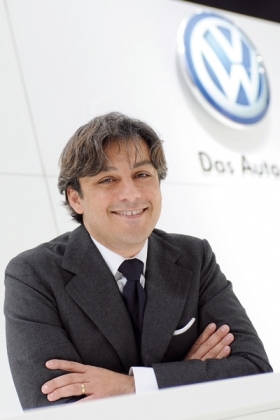 Luca De Meo, VW Group's marketing chief, is increasingly relying on new Internet trends such as Facebook and iPad apps to get across the German automaker's marketing messages. He explained his strategy to Henning Krogh, a staff reporter at Automotive News Europe sister publication Automobilwoche. What are your marketing aims? I came to Volkswagen a year ago, and since then I have mainly worked in three directions. For one thing, my goal is to internationalize the brand. Volkswagen is a global player, and the importance of the international markets is growing immensely. For another, I facilitate the company's move into new media, such as the Internet and social media. This is becoming increasingly important to the consumer who would like to get closer to the brand. And the third is my firm conviction that we must tie all our marketing activities directly to our dealer showrooms, to raise the issue of customer relationship management to a new level. How far are you along with the global implementation of the Das Auto brand claim? We have established the claim at high speed in about 100 countries. At the same time, I don't just see Das Auto as just an advertising slogan, but also as an internal stimulus for VW marketing teams in the entire world. The reason is that we have the clear goal of being the benchmark for the auto industry. VW wants to establish its core marketing process worldwide to exploit synergies. Can you cite a specific example of this? A great deal has already happened in my first year with VW. We have already invited the Volkswagen brand's international marketing managers to an exchange of strategic thinking, so we could continue to bring the Das Auto claim to life. I don't mean philosophical discussions, but rather practical measures. So we are now using our markets as centers of competence, which we can use to send good ideas across national boundaries. The benefit is already tangible. For example, together with all the company's brands worldwide, we agreed last year on a common partner for media purchasing, the MediaCom company. That is giving us substantial advantages in efficiency and major synergies. And next year, we'll go “on air” with the largest platform in dialog marketing so far. We are launching it in China, not in Europe or somewhere else. The reason is that China has absolutely become one of the most important markets to Volkswagen. VW recently launched the new Polo GTI exclusively on Facebook. What concepts relating to online media are conceivable in the foreseeable future? When we presented the Polo GTI on Facebook, many observers were already predicting the end of the traditional marketing platforms. I see things differently. Instead, an additional channel is opening up for us. My experience is that we can complement – and not eliminate. With the Facebook involvement, Volkswagen can prove that we are serious about our plan to be first. On the day that the iPad was launched in Europe, we immediately had the appropriate app. We want to be fast and dynamic – and stay that way. And speed is part of brand management. We'll display the new Passat, with its wealth of technical innovations, at the Paris auto show. Our job in marketing is to explain the entire spectrum of innovations quickly and comprehensively. Our activities in Paris will also underscore our high-tech claim – with concepts from the field of “augmented reality,” with 3-D technologies, with iPads for the stand's staff to communicate information. Marketing has to become high-tech. You have to master and understand the new technologies to reach consumers. That is a new and immense challenge. VW wants to further strengthen its customer relationship management – what can marketing contribute to this? Just think about the banking sector or about airlines' check-in procedure. Their increasingly innovative technologies are taking hold in customer relationship management. I think that speed is the key here as well. The auto industry and its dealers could benefit from that. We must gear up for customers who request online services. We know that today 90 percent of people looking for a new product start out with an Internet search. As recently as four years ago, it was just 60 percent. In the U.S., many car customers have long driven to the dealer of their choice, and then used their smart phones to search for more information on the vehicles displayed in the showroom. We have to gear up for that. And fast. Many experts say sales cannibalization is a threat to VW's Skoda and Seat brands. How will you differentiate the brands more? For as long as I can remember, I have seen the Volkswagen Group as the company that is the most successful at managing multiple corporate brands in the world. It's an extremely important virtue for the Volkswagen Group. What benchmarks from marketing in non-automotive industries are interesting to VW? The marketing of many auto companies is well positioned. But there is naturally expertise in other industrial sectors. Among others, we look to marketing by many financial institutions and service industries for inspiration, especially in the handling of customers.